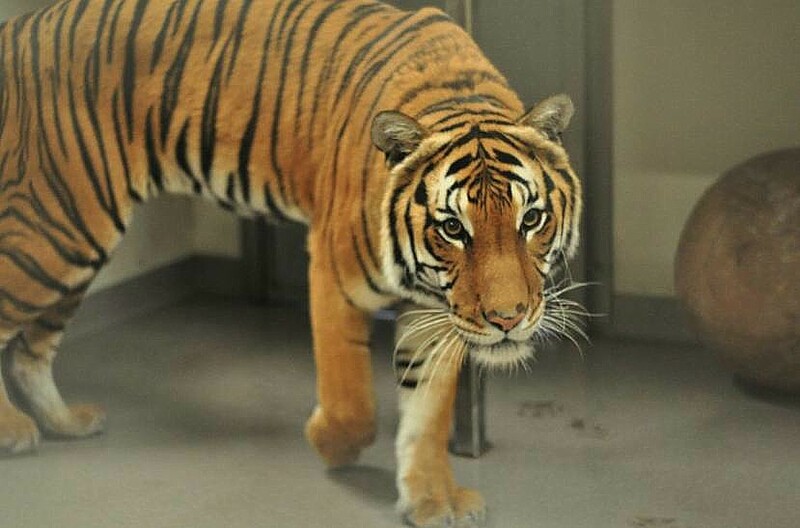 Bumi, a four-year-old male Malayan tiger whose name means “earth” in Indonesian, joined the Palm Beach Zoo as its newest resident on December 10, 2014, bringing the number of adult tigers at the Zoo to four for the first time. For the first time ever, the Palm Beach Zoo & Conservation Society is home to four adult tigers. The Zoo has been home to Keemasan Mata, a nine-year-old male Malayan tiger, Berapi Api, an eleven-year-old female Malayan tiger, and Angin, a four-year-old male Malayan tiger. Other milestones for the Zoo include Angin’s public debut, as well as completion of and debut of tigers in a new section of the Henry & Charlotte Kimelman Tiger Habitat, which has been under construction for nearly a year. Angin made his public debut in the Zoo’s “Tiger Falls” habitat on December 16th. The Zoo’s first Tiger Talk in the new “Tiger River” habitat section occurred on December 18th and featured Berapi Api. Bumi’s transition from Tampa to West Palm Beach is part of a recommendation by the Association of Zoos and Aquariums (AZA) Species Survival Plan® (SSP) for Malayan tigers. The Zoo will house Bumi in the Zoo’s Melvin J. & Claire Levine Animal Care Complex for a minimum of 30 days, after which he will move to the Tiger Falls habitat. Officials have not yet set a date for Bumi’s public debut. The Zoo is expanding the tiger habitat to double its original size. This expansion project is supported by the Zoo’s newest corporate sponsor, Braman Motorcars Palm Beach & Jupiter. The company’s sponsorship is helping continue the Zoo’s commitment to providing quality care and a natural habitat for its resident tigers. A grand opening ceremony for the new section of the tiger habitat will be scheduled in 2015. The Zoo is a recognized leader in Species Survival Plan breeding programs for Malayan tigers, with three male Malayan tiger cubs, Jaya, Bunga and Penari, born at the Zoo in 2011. The wild Malayan tiger population has recently been estimated at fewer than 250 animals. Malayan tigers are the most endangered of the tiger subspecies, and they are among the smallest of the tiger species. Malayan tigers are indigenous to the Malay Peninsula, for which they are named. Initially, decline in tiger numbers was primarily due to a tremendous loss of habitat. More recently, the greater threat has been from poaching for its body parts, persecution by angry villagers, and starvation as their prey is over-harvested. The Zoo is located at 1301 Summit Boulevard in West Palm Beach, Florida. The Zoo is open from 9 a.m. to 5 p.m. every day, except Thanksgiving and Christmas. For more information, visit www.palmbeachzoo.org. 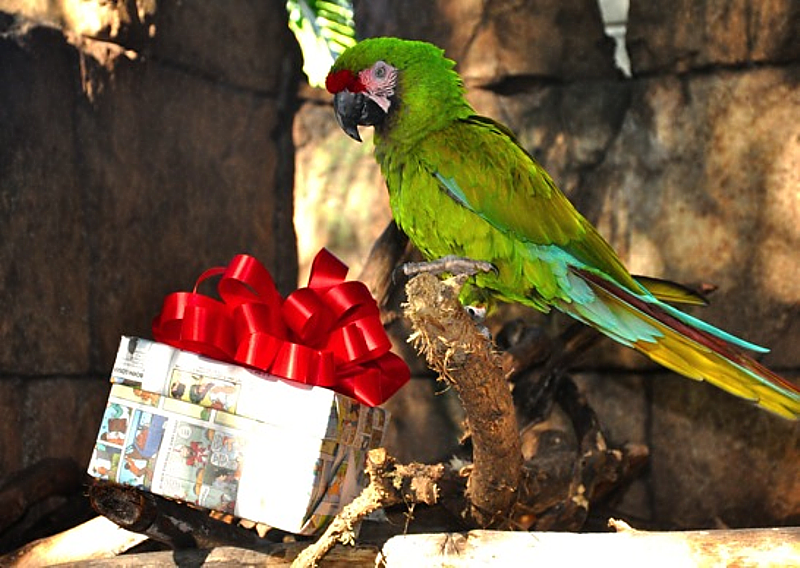 Patton, a military macaw, enjoys a gift wrapped with recycled newspaper at the Palm Beach Zoo, which is hosting an”Eco-Friendly Holiday” series. WEST PALM BEACH, Fla. — The Palm Beach Zoo & Conservation Society is announcing its first-ever “Eco-Friendly Holiday” décor theme, in which it will model methods of naturalistic, “green”-themed decorations. Guests are encouraged to visit the Zoo from December 13, 2014, through January 1, 2015, to view ways in which they can explore ideas to “green” their holiday traditions, and to receive conservation messaging tips in signs spread throughout the Zoo. Zoo staff members worked with student volunteers from G-Star School of the Arts, who helped to design the eco-friendly decorations. The students also created the décor through activities such as draining coconut ornaments, painting wooden houses and trees for a play area in the Zoo that will be decorated with inspiration from “Whoville,” and constructing giant holiday presents that will be spread throughout the Zoo. The students will install the decorations they created on December 11. The entire month of December, guests are invited to watch as zookeepers will feature special holiday enrichment activities for various animals, beginning with a jaguar and capuchin monkeys receiving gifts on December 6, 2014. The public is encouraged to follow the Zoo on their Facebook, Twitter and Instagram accounts to stay informed about animal holiday enrichment schedules. Children can create their very own snowflake ornament and snowman necklace made from natural materials in eco-friendly craft workshops on Saturday and Sunday, December 13 – 14 and 20 – 21. As a special treat, Rudolph the Red-nosed Reindeer will also be making appearances throughout the course of the workshops. Funds raised benefit the daily operations of the Zoo. “We are proud to showcase decorating in a more eco-friendly way during this time of year,” said Andrew Aiken, president and CEO for the Zoo. “Celebrating with a sustainable holiday is meaningful to us as part of our mission. The Palm Beach Zoo & Conservation Society has announced that Berapi Api, a ten-year-old Malayan tiger who mothered three male cubs at the Zoo in 2011, is expected to give birth within the next six weeks. This will be her fourth litter, and the second litter sired by Keemasan Mata, who returned to the Zoo in January. This pregnancy is significant because the Malayan tiger is a critically endangered species. The two tigers were paired in February through a breeding recommendation made by the Tiger Species Survival Plan (SSP) of the Association of Zoos and Aquariums (AZA). The two tigers were separated after breeding, since tigers are solitary in the wild. Mata will remain on exhibit at the Palm Beach Zoo. Berapi has been exhibiting signs of pregnancy, including steady weight gain and a growing belly that has shown movement in the past week. A tiger’s gestational period is typically 93-110 days, with 100 days being the average. Zoo officials halted the construction of the Henry and Charlotte Kimelman Tiger Falls Habitat last month to ensure Berapi is not disturbed by loud noises. The new habitat will open in the fall, and will double the size of the current tiger habitat. Construction will resume a minimum of one month after the tiger cubs are born. Berapi has preferred to remain in the tiger night house, only venturing out in the cooler evening hours. Zookeepers are following a normal routine with the expectant mother, and are making a point not to hover unnecessarily. Mother tigers have been known to kill their cubs if they feel threatened, and Berapi abandoned the first two of her three litters. A remote camera inside the night house allows zookeepers to monitor the pregnant tiger. Berapi was born on December 23, 2004, and weighs 220 pounds. Mata was born on June 4, 2005, and weighs 340 pounds. Malayan tiger births are extremely rare, with only one other AZA zoo having Malayan tiger cub births this year. Zoo officials said each tiger birth is critical to help preserve the species from extinction, as scientists estimate fewer than 500 Malayan tigers exist in the wild. Every tiger cub born will contribute to the genetic diversity of the Malayan tiger population and species conservation efforts. Malayan tigers are among the smallest of the tiger species, and are named after the Malay Peninsula where they are found. Initially, decline in tiger numbers was primarily because of a tremendous loss of habitat. More recently, the greater threat has been from poaching for its body parts, persecution by angry villagers, and starvation as their prey is over-harvested. Go WILD this Spring Break, and Spend the Night at the Palm Beach Zoo! 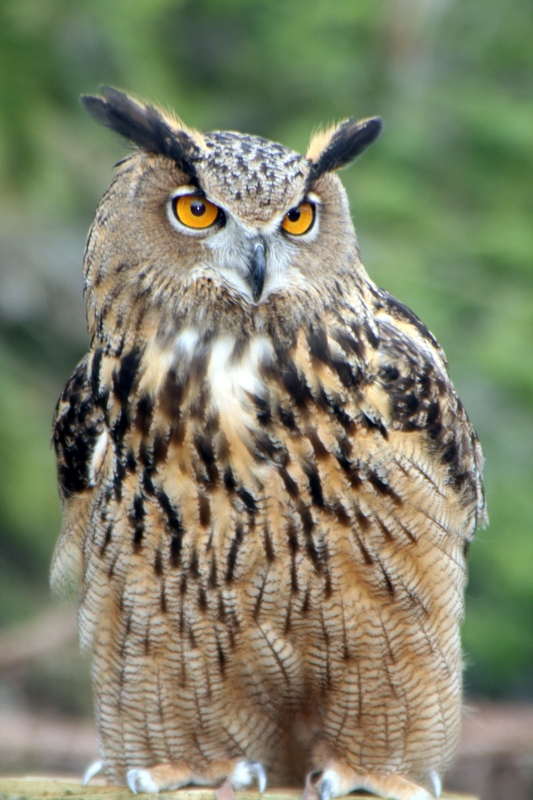 The Palm Beach Zoo & Conservation Society is hosting “Family Night Owls Overnight Adventure” for children ages 6 and up, accompanied by a parent or guardian, on Friday, March 14, 2014 from 6:30 p.m. to 8:30 a.m. This extraordinary opportunity to spend the night at the Zoo is a nocturnal adventure that families are not likely to ever forget. Activities include up-close animal encounters, night tours of the Zoo, crafts, games, a pizza snack and a continental breakfast. An educator will meet guests at the front of the Zoo at 6:30 p.m. The program begins at 7 p.m. and ends at 8:30 a.m. the following morning. Overnights usually sleep in the pioneer house in the Florida section of the Zoo. Guests should bring a sleeping bag, pillow, air mattresses or cots (able to bring but not necessary), sleeping pad, flashlight, bug repellent lotion, camera and a change of clothes. Outside food is not permitted. The overnight will only be cancelled if the weather is deemed severe/hazardous. Pre-registration is required. To register, visit the Zoo’s website at http://www.palmbeachzoo.org, or contact the Zoo’s education coordinator at (561) 547-WILD ext. 229. Palm Beach Zoo lost its only Florida panther with the passing of Colin Patrick last March. 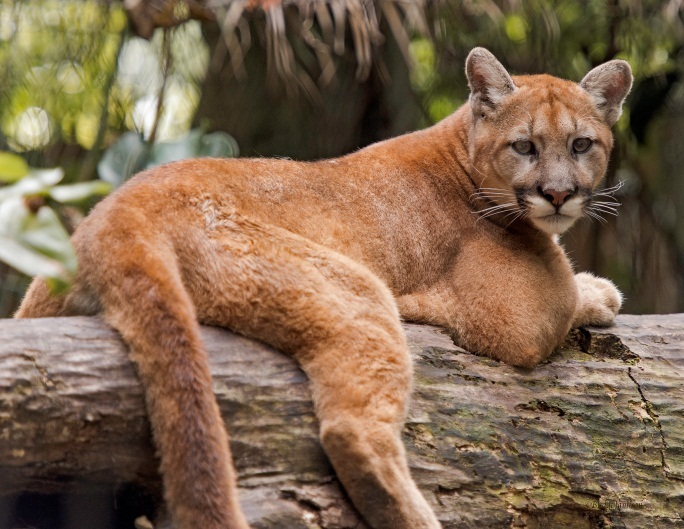 The two cats you currently see in the Florida wetlands exhibit, Washington and Idaho, are western cougars. With fewer than 100 left in the wild, the Florida panther is one of the most endangered mammals in the world. You can learn how to protect our state’s official animal during a state-wide observance of Save the Florida Panther Day at the Palm Beach Zoo, West Palm Beach, Florida. Save the Florida Panther Day will be held on Saturday, March 16 from 10 a.m. to 3 p.m. This state-wide event focuses on the importance of saving the critically-endangered animal. Special keeper talks at 10:30 a.m. and 2:30 p.m. will incorporate the history, habitat stresses and conservation efforts surrounding the Florida panther. Activities will also include interactive children’s games and educational crafts in the Florida Pioneer House near the panther exhibit. Palm Beach Zoo lost its only Florida panther with the passing of Colin Patrick last March. The two cats you currently see in the Florida wetlands exhibit, Washington and Idaho, are western cougars. They are members of the same puma family, but a different subspecies. Washington and Idaho serve as ambassadors for the Florida panther. It has been illegal to hunt Florida panthers since 1958. They have been on the federal endangered species list since 1967 and on the state’s endangered list since 1973. There are several reasons for their decline in population: habitat loss, disease and collisions with vehicles. The Palm Beach Zoo is located at 1301 Summit Boulevard, just east of I‐95 between Southern and Forest Hill Boulevards. The Zoo is open from 9 a.m. to 5 p.m. every day except Thanksgiving and Christmas. For more information, visit www.palmbeachzoo.org. The Palm Beach Zoo is inviting families to explore the zoo at night, and camp out in the Florida Pioneer House. This family-friendly overnight is available during President’s Weekend (Saturday, February 16) and Spring Break (Saturday, March 23), and takes place from 6:30 pm to 8:30 am. You’ll get an up-close look at our animals and learn about their behavior, especially animals that are only awake at night. Your adventure will include a guided night-time tour, hands-on animal encounters, making an enrichment item for the animals to enjoy the next morning, and other wild activities. Participants will enjoy a pizza snack and continental breakfast. This program is also available for birthday parties, scout troops, and community groups. The program is available for children ages 6+ (one parent must attend with children). The cost is $35 per member; $45 per non-member. 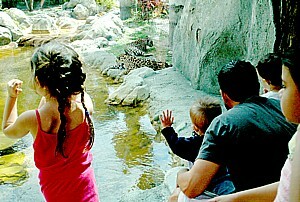 For more information, visit our website www.palmbeachzoo.org and click on the Education tab. You can also call (561) 533-0887 ext. 229 or email education@palmbeachzoo.org. Be one of the first visitors to see three new babies – including a baby Chinese muntjac- at the Palm Beach Zoo during a special event, Super Baby Saturday, on January 26 (photo courtesy Palm Beach Zoo). Be one of the first visitors to see three new babies at the Palm Beach Zoo during a special event called Super Baby Saturday, January 26, 2013. Baby giant anteater, Delilah, was born on September 28. 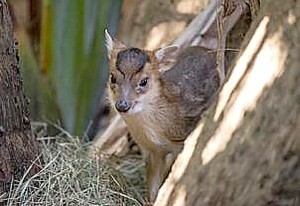 A baby Chinese muntjac was born December 19. A baby spider monkey was born December 30. The muntjac and spider monkey have yet to be named. · 9:30 a.m. – Giant anteater cloth-diapering contest. Prize from Lalabye Baby. · 10:30 a.m. – Keeper talk on giant anteaters, check out Mom and baby, Delilah. · 11:30 a.m. – Stroller walking race. Prize from The Learning Express. · 1:30 p.m. – Keeper talk on Mexican spider monkeys, check out Mom and baby. · Safe Kids Palm Beach County will be at the Zoo all morning handing out information on how to keep your children safe in the car. For more information, visit www.palmbeachzoo.org and click on the Events tab. The Palm Beach Zoo is located at 1301 Summit Boulevard, just east of I‐95 between Southern and Forest Hill Boulevards. The zoo is open from 9 a.m. to 5 p.m. every day except Thanksgiving and Christmas. For more information, visit www.palmbeachzoo.org. 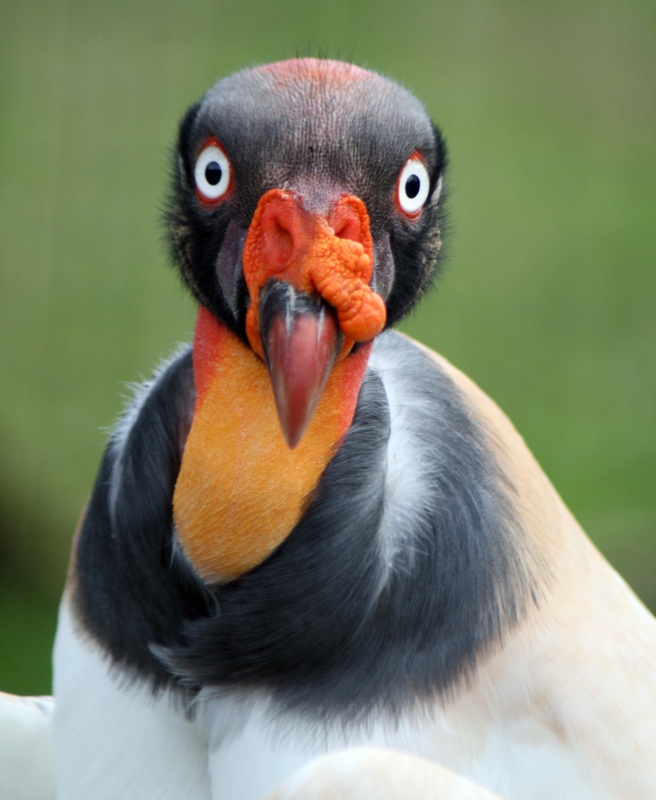 King Vulture is one of the creatures showcased at the Palm Beach Zoo’s Halloween events (photo by Keith Lovett). The Palm Beach Zoo has announced plans for special Halloween events in October. Boo at the Zoo, a South Florida family favorite will be held on Friday through Sunday, October 19th to 21st and October 26th to 28th from 10 a.m. to 5 p.m. and on Friday evenings, October 19th and 26th from 5:30 p.m. to 9 p.m. The Zoo will also offer a special family overnight program called Spooky Snooze on October 6th, 20th, and 27th. Boo at the Zoo was founded over 15 years ago to provide the community with a safe and educational venue for trick-or-treating. Since that time, Boo at the Zoo has become Palm Beach County’s #1 family event during the Halloween season. In 2011 nearly 10,000 guests attended during the six days of celebration. Festivities include trick-or-treating, provided by local vendors, and children’s entertainment including games, crafts, hay-stack hunt, decorate-your-own pumpkin patch, bounce house, face painting, photo opportunities throughout the Zoo, Monster Mash dance parties in the Fountain Plaza, Halloween-themed treats in the Tropics Café, special Halloween treats for the animals, roving animal encounters, and costume contests. Spooky Snooze Overnights at the Zoo will be held on October 6th – 7th, 20th – 21st, and 27th – 28th. The program begins on Saturday evening at 6:30 p.m. and runs through Sunday at 8:30 a.m. Evening activities include pumpkin painting, crafts, night time tours, an evening pizza snack, and Continental breakfast. Activities are designed for family members ages six through adult. Mummies and/or daddies must attend with their children. For more information on these programs, visit www.palmbeachzoo.org. For additional information on the Spooky Snooze program e-mail education@palmbeachzoo.org, or contact the Education Coordinator at (561) 533-0887 ext. 229.